cause dn yan ng traffic talaga sa magallanes. kaso hindi ko alam kung ok bang sinara nila yan. dahil siguradong mas mag ta traffic sa bandang villamor. magkano kaya palit headlights ng sentra. headlights kasama ba kaha? or yung mismong bumbilya lang? MANILA - Motorists who violate the 60 kilometers per hour speed limit along EDSA and other main thoroughfares in Metro Manila will be fined P1,000 for every offense, authorities said Friday. The fine and speed limit were imposed after authorities found that "vehicular accidents which occur in the major thoroughfares of Metro Manila can be largely attributed to overspeeding," the Metropolitan Manila Development Authority (MMDA) said in its Regulation No. 19-001 published on newspapers. Buses and trucks are exempted from the policy, the announcement read. The MMDA has yet to clarify why buses and trucks are not covered by the new rule. Apprehensions would start on April 9, 5 days after the regulation was published on newspapers. teka mga chong, binasa nyo ba to? ang lakas maka pvtangina neto ah? Assistant Secretary Celine Pialago, MMDA spokesperson, said there was already an existing policy regulating the speed limit of trucks and buses, referring to MMDA Regulation No. 17-003. 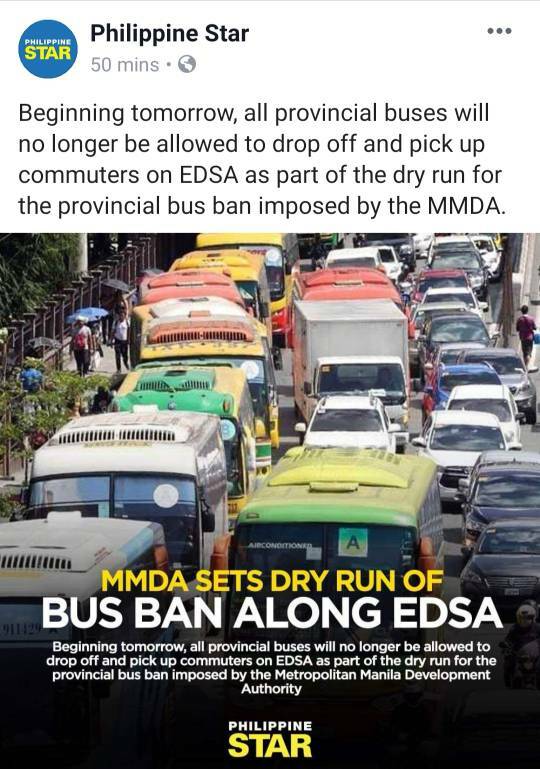 “There is already an MMDA regulation for buses and trucks. MMDA Regulation No. 17-003 only permits buses and trucks to travel as fast as 50 kph,” she said after some netizens slammed the agency for exempting buses and trucks from the new policy.